The warm Hawke’s Bay weather is setting one of New Zealand’s leading onion growers up for a strong crop. Bostock New Zealand Director, David Brasell says that after a cool, wet spring the onions are now responding well and the company is set to meet target dates and volumes for the season. Bostock New Zealand has invested heavily in pack house and harvest technology and is excited about gearing the new equipment up for the season. “With improved expertise and investment Bostock New Zealand can continue to deliver good quality onions,” said Mr Brasell. “Our new automated bagging machines ensure more accuracy and efficiency and response time. If the orders are late we can respond quickly and still meet those orders. 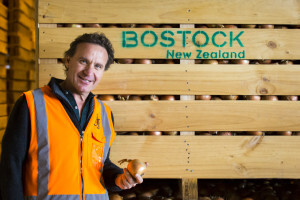 Bostock New Zealand Owner John Bostock says they focus on growing a premium storage onion and have a strong focus on traceability. “At Bostock New Zealand traceability is extremely important, our technology enables us to trace each field, each harvest date, each packing date, so we know exactly where every bag of onions shipped to our customers comes from.